Frankie Dettori has spoken of his determination to race for another few years yet after it was rumoured that he would retire after failing to secure a ride for the Epsom Derby. Speculation was rife – even amongst those in poker rooms online - in the last few days that Dettori was past his best and failing to compete at Epsom was the final straw. However, in a typically determined attitude, he has responded. 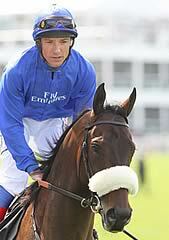 Mickael got the ride in the Oaks on the word of the boss [Sheikh Mohammed] and Mahmood Al Zarooni. "Nevertheless, I then got a call from Coolmore asking if I could ride in the Oaks. The boss said I could if I wanted to. As it happened, nothing came of it but it shows I'm in demand. Goldolphin racing manager Simon Crisford has also dismissed any rumours linking Dettori with retirement, saying that he still has a lot to give. Commenting on the speculation, Crisford said: “Frankie is still hungry. Nothing has changed - Frankie is still our senior rider but Sheikh Mohammed will decide who rides what, and he knows that. "The situation has just been exacerbated because we haven't got a runner in the Derby and we've only got one in the Oaks. Frankie is experienced and Mickael is very young, but a tremendous talent - we are thinking years ahead. "Mickael rode Kailani last time out and His Highness was keen for him to keep the ride. If Frankie had ridden her last time I'm sure he'd be on her. "Sheikh Mohammed likes to try new things. Frankie has been with us from the beginning and knows how we work. It is certainly true about Dettori’s enthusiasm. If all sportsman were like him, it would be an encouraging thing. It seems almost certain that he will have some positive days in the horse racing world as yet. There are lots of people hoping he continues too. With the backing he has, the enthusiasm he still has and let’s face it, the ability as a jockey, this isn’t the last we have seen of Frankie Dettori.